On this page we’ve estimated United States Household Income Brackets for 2018. This data is for households in the United States, for income earned between January and December of 2017. We include a table of every household income percentile for 2018 United States data including the top one percent. We also have research on individual incomes. Here we estimate breakpoints for the 10th, 25th, 50th/median, 75th, 90th, 95th, and 99th percentile of household income percentiles. Full year 2017 data revealed a large broad based increase in household income for every income bracket except the 1st and 2nd percentile. For every bracket from the 3rd percentile to the 99th percentile, it took more income to be in a bracket. Median household income was $61,822.00 in 2017, and the threshold for a US household to be in the 1% was $434,454.80. Inflation adjusted, those breakpoints were up +2.90% and down -1.17%. Average household income in 2018 in the United States was $86,599.91. Amounts quoted are net of CPI adjustment as seen here. Data originated in the United States Census Bureau’s Annual ASEC survey, first released in September 2018. 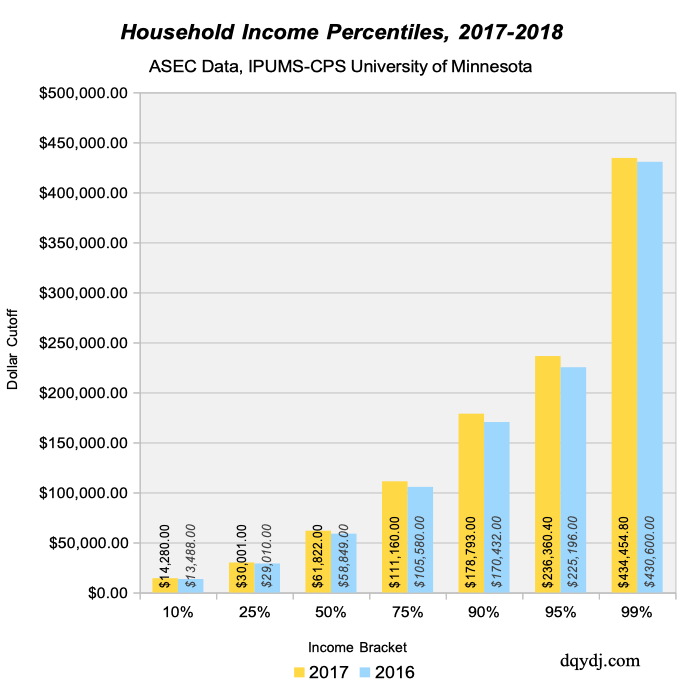 The University of Minnesota’s Minnesota Population Center harmonizes it and makes it easy for us to create extracts to bring into R.
2017: 67,909 data-points representing an estimated 127,679,100 American households. Important note: the data is not longitudinal. You can not draw any conclusions about the performance of individual households from this data. Households in certain income brackets move up or down the income spectrum, but the data as presented doesn’t give any history of movement. Although we can’t come to any conclusions about the performance of individual households, the data was encouraging for its broad based income gains. The only way you’d see such a large increase in (inflation adjusted) income is if there were increases across the board. Outside of a select few income brackets – including, curiously, the top 1% of households – incomes increased across the board after inflation. That shows a general increase in buying power for many American households from full year 2016 to 2017. See the post from 2017. How did your household income compare last year? Did you expect every household income bracket to see an increase? Just out of curiosity, does the drop in the top 1% fall inside the range of the standard error? I would think that based on equity market changes alone, the top 1% should have seen growth in calendar year 17. Maybe it is a tax strategy move? If you could delay income to a year with lower taxes (out of 17 into 18), you could theoretically come out ahead. 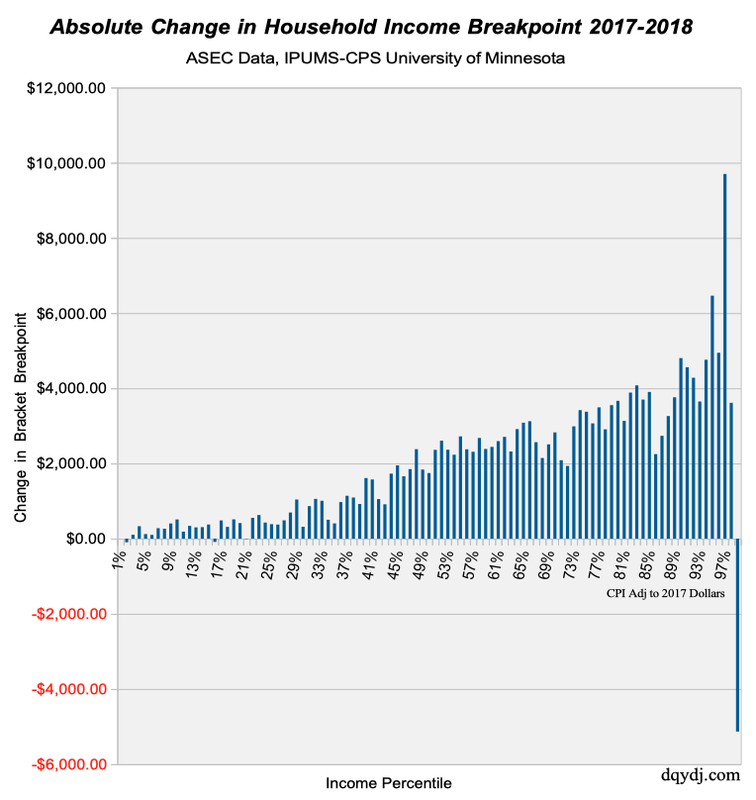 Important note on that particular income bracket: before inflation the 1% breakpoint increased; last year it sat at $430,600 (in full-year 2016 dollars, CPI). Tax strategy is a good hypothesis for some folks last year. I personally shifted some things forward (significantly, one property tax payment) which are really only a one time move. We won’t really be able to answer that until next years drop, but we might see an interesting hitch at the top end. I’m honestly a little surprised that we didn’t see a drop across the top 10% with the SALT exemption losing quite a bit of its effectiveness. I guess the income gains nation wide were enough to offset the pre-payment of property taxes in high tax areas. Confused. The charts show 2016. That’s a tough one. The survey is conducted in March of each year so it’s really the ‘previous’ year (e.g. 2018 would be full-year 2017). The first chart that lists 2017 and 2016 is the last 2 years of surveys, but it’s comparing the full year of 2016 vs. full year of 2017… and was conducted in March 2018 and March 2017. The survey conducted in March 2019 will be for all of this year. March is a good month because it’s convenient for tax returns and we’ll get better numbers on full year income. Is this adjusted gross income, or some other measure? That variable is summed for all members of a household.